By Xah Lee. Date: 2019-02-03 . Last updated: 2019-02-24 . 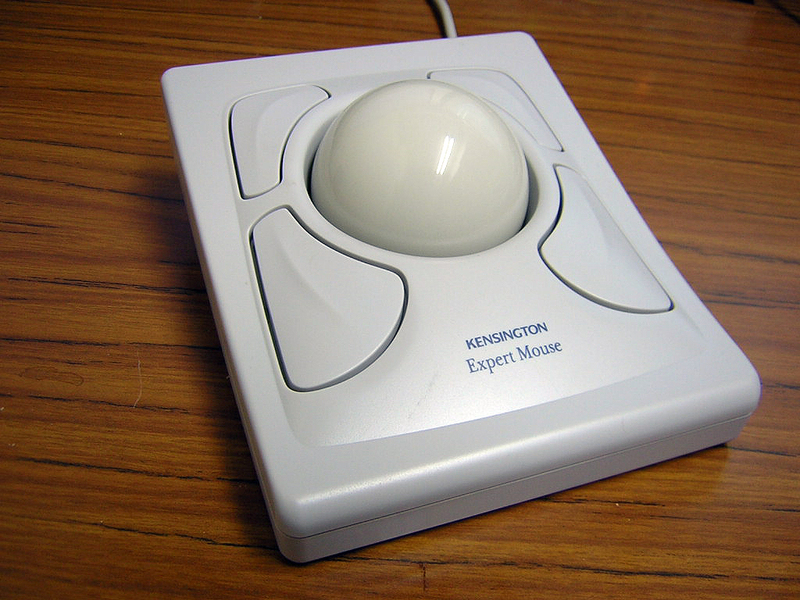 Kensington was famous, throughout the 1990s in the Macintosh community, for its large ball trackball. 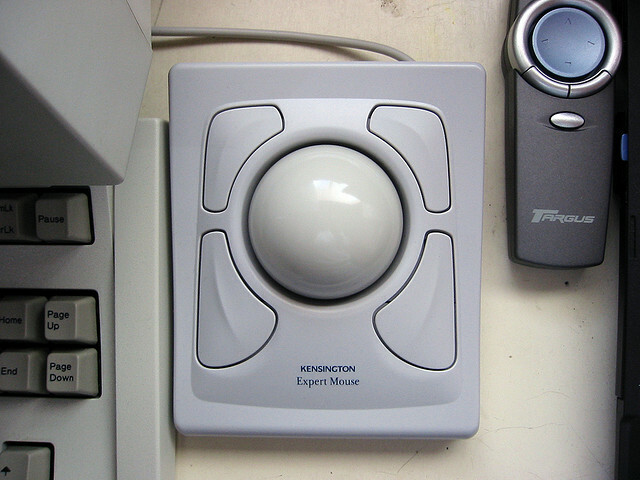 In almost all 1990s, the Kensington trackball is the coveted device for high-end Mac owners for all their graphics design needs. Since the 2000s or perhaps late 1990s, their market got eaten by Logitech Trackballs, and i think their product's quality and innovation also gradually declined. I think one major problem is that the ball has a lot friction. I remember i tried it in stores and think the friction is the worst of all trackballs i've put my hands on. Also, Kensington's classic design always seems unwieldy for me. That you have to bend your wrist up to use it. If i actually use this, i'll have to put a folded-towel in front to rest wrist on. Kensington Turbo Mouse, came out in 1999. Kensington 64213 Expert Mouse pro. Came out in 2001. Kensington Turbo Mouse Pro USB Trackball with 6 Direct Web Buttons: Don't let your mouse slow you down. 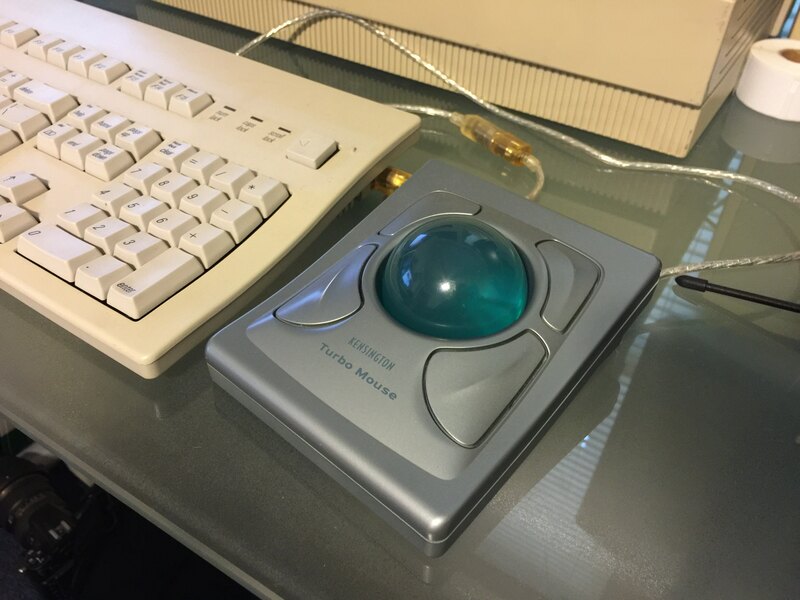 This trackball can speed things up, way up! Six Direct Launch Buttons give access to Web sites of your choice or your favorite applications, plus four programmable mouse buttons to streamline frequent tasks. There's even a scroll wheel to help you zip through documents and web pages. This is a great mouse for gamers, or anyone who spends a lot of time on the computer - and it's designed for left or right hand use. The large ball and ergonomic design ensure hours of comfortable use. The Kensington Promise: 5 year warranty with free technical support. Requirements:PC-Windows 98, Me, 2000, or XP with USB port Macintosh USB port, OS 8.1 or later Software: Not required for basic operation. Kensington MouseWorks included or free download available at www.kensington.com. Kensington Edge: This mouse trackball delivers when you have a need for speed through multiple turbo features. The heavy ball with progressive speed control is so good and so easy to use, you'll wonder why the mouse was ever invented. Large ball for precision pointing and easy control combine with steel bearings for smooth cursor movement and durability.